The Lady Panthers carried a successful record throughout the regular 2017-2018 season. 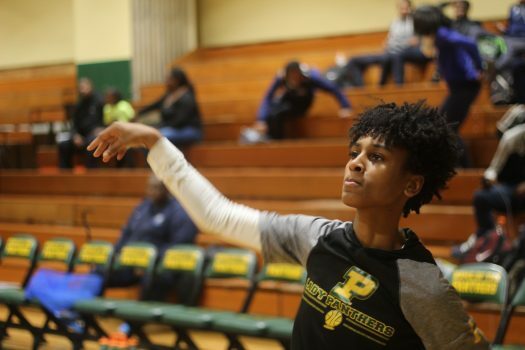 The Parkdale Girls Basketball team, also known as the “Lady Panthers,” had a good run last year, making it to the second round of the playoffs before losing to Eleanor Roosevelt 62-46. Last season, Parkdale had a record of 20-5 with their team’s leading scorer alumni Briel Palmer (PG,W) leading the way with 20.3 points per game and then-junior Drew Calhoun (SG,PG) averaging 15.3 points per game. For the past couple seasons, Coach Watson has lead the girls to the playoffs every year with a positive record. This year, they made it pretty far. Before losing to Eleanor Roosevelt High School on March 3, head coach Coach Watson was confident they would take the crown. In the regular season, the Lady Panthers had a record of 15-4 with senior Drew Calhoun (SG,PG) averaging 19.3 points per game and senior Regan Johnson (G,SF) averaging 12.6 points and 13.5 rebounds per game. Expectations were high for the Lady Panthers, as they have been able to walk away with wins that have blown their opponents out of the water. Their first regular season game against Duval ended with a winning score of 65-23, shortly followed by another win of 52-29. The players anticipated that the Roosevelt game would be their defining moment. Before the game, junior small forward India Thompson was hopeful they would win. After blowing Duval and Laurel out of the water, the Lady Panthers lost to Roosevelt 55-46.